The Image of Our Lady of O Corpiño, for so many generations venerated, is a “candlestick” carving. It is one meter height of polychromed chestnut wood. The image follows the description of the apparition in the document we have in the archive of the Sanctuary (you can read it in our section “The Tale of the apparitions”). The Virgin of O Corpiño carries a bouquet of flowers in her right hand and a precious Child Jesus on her left arm. The Saivor of the World carries on his left hand the orb of the world and bends the fingers of his right hand in a sign of blessing. The serene face of the Virgin, where a smile is glimpsed, attracts the eyes of the devotee even before entering the Shrine. 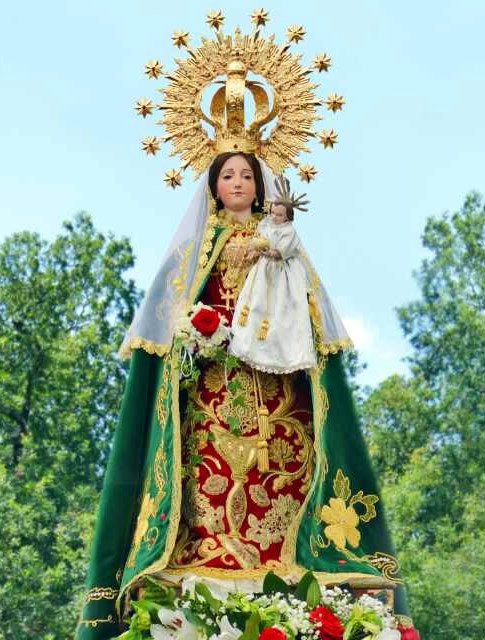 It has long natural hair and an imperial crown surrounded with a halo of 12 stars as the Queen of Heaven and Earth. Meanwhile the head of the Child Jesus appears covered with his three powers, meaning his own identity and Divine Power. We must say here that the stone Image of Our Lady of O Corpiño that is in the main façade of the Sanctuary is a precious relic and the only thing that remains of the first hermitage.